The abortion that is Australian politics; Julia Gillard and homos; piracy, privacy, surveillance states and why Hollywood must be destroyed; islam, Geert Wilders and why Sam Harris needs to read more; and a shitload more. I grew up with MaximumRockNRoll. Whilst far too often wallowing in identity politic nihilism, it was a priceless resource for alt.culture in the pre-internet stone age. It kept many of us sane, providing endless resources to other folks like us cruelly separated by the tyranny of distance. 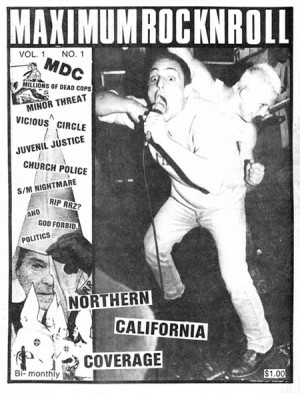 The premier issue was July 1982 – which makes us scumfucs that remember pushing 50 and beyond. The age that we used to hate with a fearsome passion. Central to MRR’s appeal was knowing you were not alone. That there were others on the planet that held the same contempt for what passed as pop culture of the time. For me personally, rock bottom was reached here, also in 1982 – ABC and Look of Love [masochists can click here]. I cannot articulate the despair that was evoked by this nothingness that was everywhere – every music teevee show, every commercial radio channel, every shopping mall, pub and club. Noxious, spotty teenagers pumping dimes in jukeboxes playing the same non-music, bubblegum garbage everywhere. There was no escape. But there was MRR – and it was a lifeline. Seriously, what is at stake is your right to interact; to criticise; to parody; to discuss. SOPA/PIPA wants to give carte blanche censorship powers to the corporate sector. The real target is you. Hollywood creates nothing. Neither does the RIAA. Ask them – have they ever returned a cent to artists by suing dead people and single mothers? They will not answer. They are parasites. Dinosaurs that natural selection is removing from the biosphere. They have no function other than to serve themselves. Herein lies their desperation. So are the politicians that are selling you out. Register to vote – and remember who’s who. Valhalla Cinema, Glebe. Being turned into another filing cabinet for yuppies. Grey Lining by Franc Hoggle is licensed under a Creative Commons Attribution-NonCommercial-NoDerivs 3.0 Unported License. Based on a work at greylining.wordpress.com. Permissions beyond the scope of this license may be available at https://greylining.wordpress.com/.